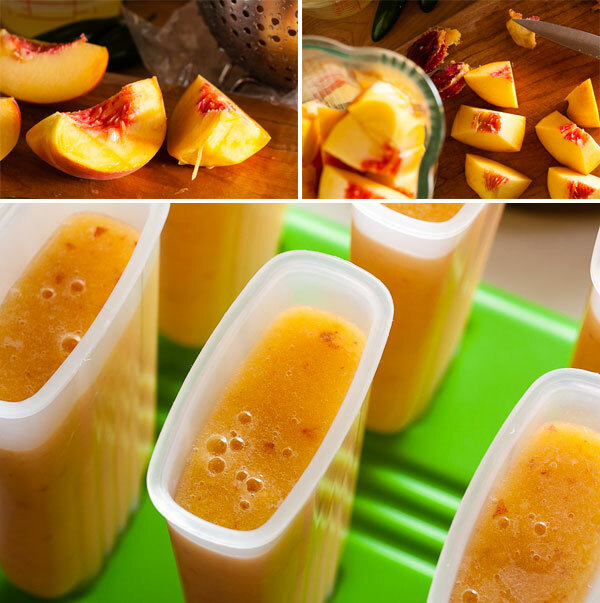 Peach Jalapeño Popsicles | wanna come with? A bit of heat in an otherwise sweet treat is a beautiful thing, like jalapeño jelly, and chocolate cookies with fresh grated ginger. Even mango salsa, although technically I guess that’s a hot dish with a bit of sweetness. I remember my old English teacher telling me about her time living in Mexico, and one of her favourite things was oranges with hot sauce injected into them. So of course I had to try one – trust me, it’s a treat! I’ve even been known to dip pieces of chocolate in salsa – don’t mock, it’s good! 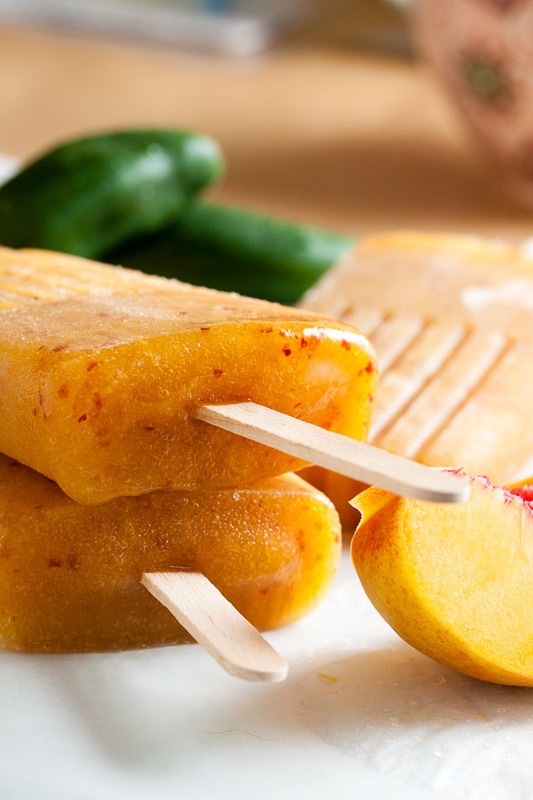 So when I saw this recipe for peach jalapeño popsicles, I was ready for something amazing. 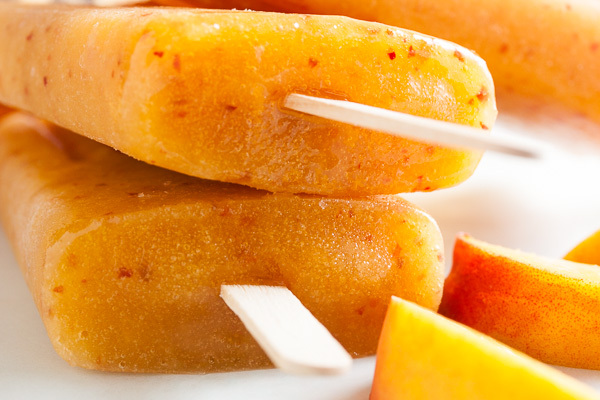 We’re right in the middle of peach season here, so the timing couldn’t be better. A word of warning. The original recipe didn’t say anything about what size of jalapeño to use. And me, wanting to ensure the jalapeño flavour didn’t get lost altogether, I picked a big one. And the original instruction is to simmer the pepper for 5-10 minutes in the sugar syrup, and of course I chose to simmer for the full 10 minutes. 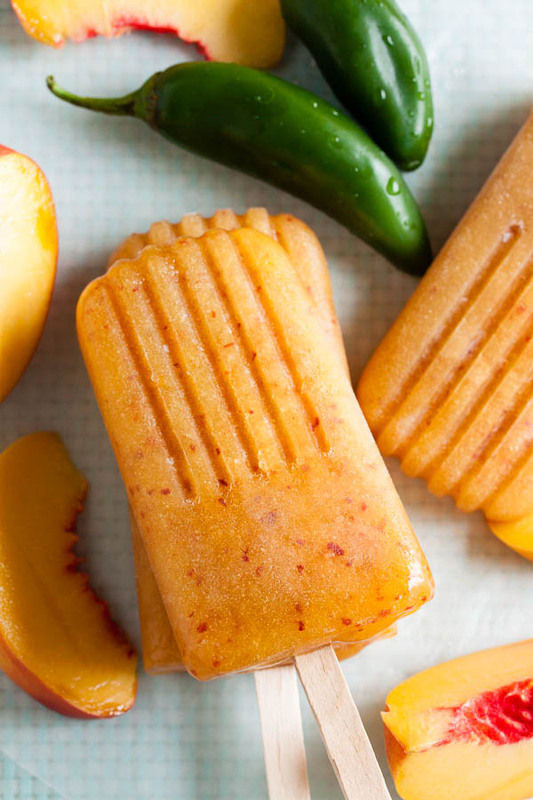 Yeah, I ended up with jalapeño popsicles with a hint of peach. Sigh. So back to the drawing board for me. Unfortunately, I used up all my peaches on my first attempt at this recipe, so I had to use my nectarines for the second attempt. But that’s just fine. Other than the fuzzy skin, they’re apparently practically the same thing! (lies – I actually prefer nectarines). Seriously, nectarines are actually a type of peach. Neat, huh? So for the purposes of this recipe, nectarines will work just fine. Second time around, I used a much smaller jalapeño and I brought the syrup to a simmer and removed the peppers pretty much immediately after that. The sugar syrup still had a very pronounced flavour, but it no longer overpowers the flavours of the fruit. This is a much better balance. Sweet and fruity with just a bit of a bite. Perfect. Combine the sugar and water in a small saucepan and stir over low heat until the sugar has completely dissolved and the liquid is clear. This will just take a few minutes. Add the sliced jalapeño and increase heat to bring to a simmer. The original recipe said to simmer for 5-10 minutes and then allow to rest off-heat for several minutes before removing the jalapeño. I found that too strong, and removed the jalapeño from the sugar syrup immediately after it reached a simmer, and then allowed the syrup to cool. You should end up with about 1 cup of sugar syrup. Transfer the puréed fruit to a large measuring cup or a bowl with a pour spout. Add the sugar syrup and stir well to combine. 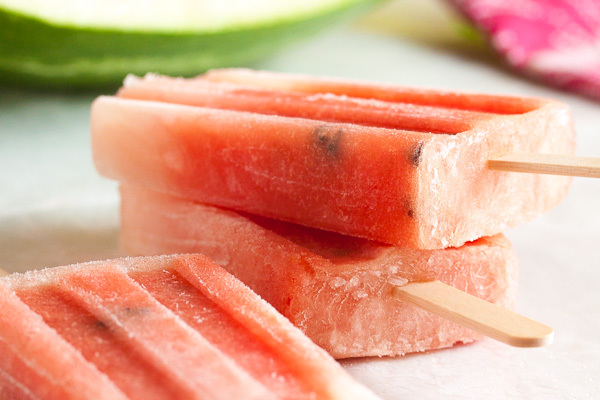 Taste it at this point – it should be sweet and fruity with a bit of heat. 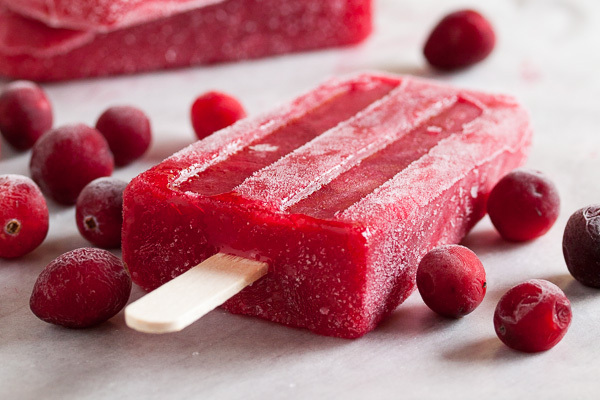 These popsicles look and sound delicious. 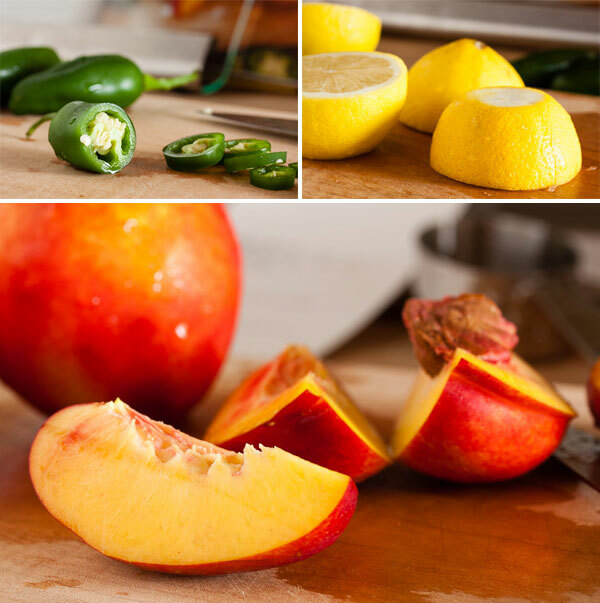 Love the idea of using jalapenos… definitely craving a bite of one right now!